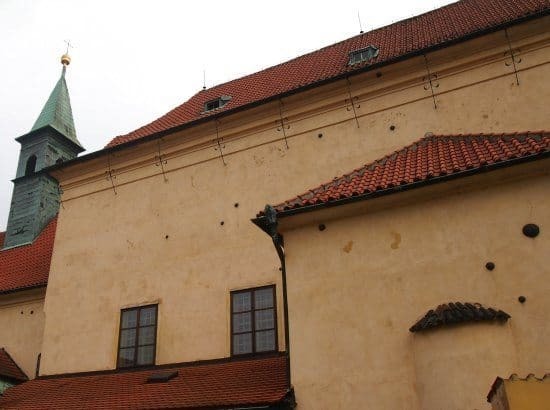 A special Prague with kids tour was high on our wish list as first time visitors to the Czech Republic, and, not having much time to plan or research, we jumped at the chance of taking Travelove’s child orientated Prague tour. 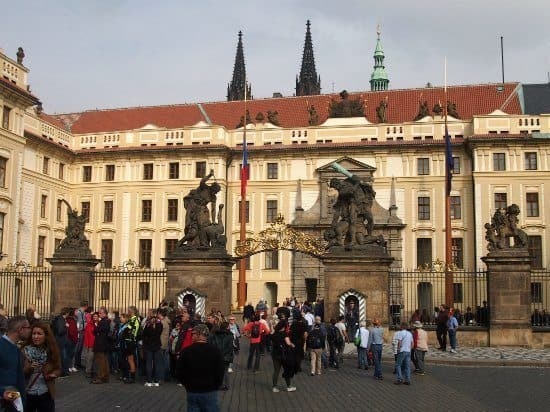 Even if you’re not planning on using a self guided tour of Prague, this post will show you some of the more off-the-beaten-track parts of Prague that kids will enjoy, away from the crowds of tourists. Prague is incredibly beautiful, it couldn’t fail to impress, but what did we think of the tour? More importantly, what did the kids think of it? 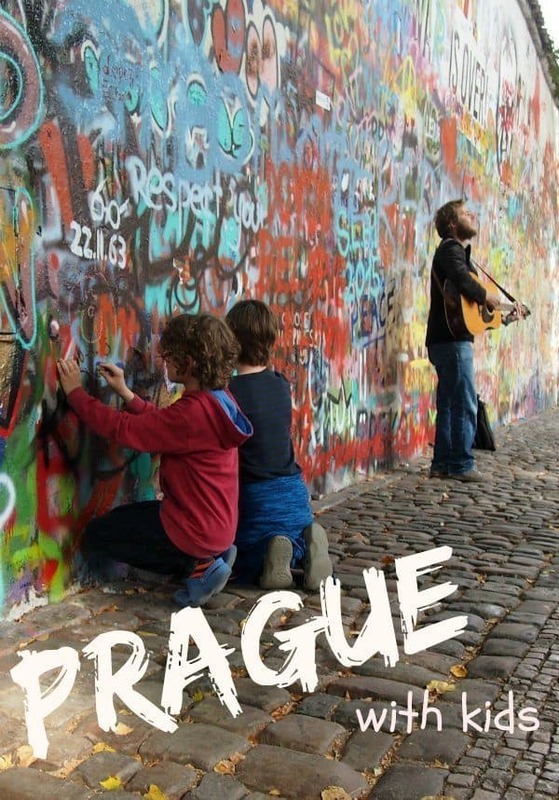 A Personalised Tour of Prague For Kids, That Pleases Adults Too. It’s that way! Photos and maps helped us find our way around Prague on this self guided, family friendly, city tour. Such a beautiful city! Travelove is a young company with a brilliant concept. They create a personalised tour of your destination city, tailored to your party and the ages of your children. The tours are self guided and there are no time deadlines, unless you choose to ask Travelove to pre-book certain activities and admissions for you. On our tour we took our time and followed our own interests while walking the Travelove suggested path and reading up on all the recommended sights we passed. Travelove tours cover many counties, including Ireland, Singapore, Israel and Turkey. See their website for full details. So how was our day in Prague? 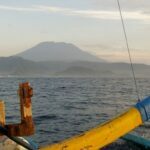 We were guests of Travelove but all views are, as always, our own. On arrival at our Prague hotel (Hotel Otakar, which we would recommend, click through to view) we found our Travelove tour bags waiting for us at reception. 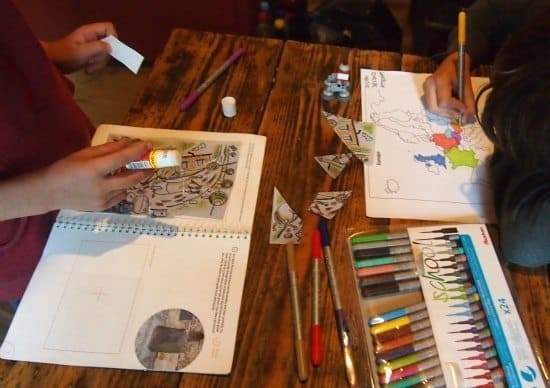 The kids received a small plastic back pack each, containing personalised city guides, chalks, pencils, glue and “treasure”. A third book, Alyson’s Prague guide, was waiting for me. Travelove tours are self guided. I had instructions, maps, directions, descriptions and images, tailored for us and our Prague hotel. Travelove told us exactly which trams to catch, how many stops to travel and where to get off, perfect! It was late, we’d had a bad day driving from Frankfurt with no GPS and we were tired, we went straight to bed planning to tackle the city in the morning. Our morning didn’t start too well as our uncharacteristic run of bad luck continued. Breakfast was late and a bowl of cereal ended up on somebody’s trousers, necessitating a shower and urgent laundering. We were travelling carry-on only, these things happen and they need dealing with immediately. The Prague tram system isn’t the easiest to fathom and the road works outside our hotel made the task of finding a. tickets and b. the right tram, a little tricky, but we worked it out eventually. See our tips on using the Prague tram system and buying kids’ tickets at the end of the post, don’t tear your hair out like I did! Best Blog Read Now! 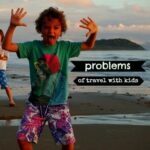 Family Budget Travel. 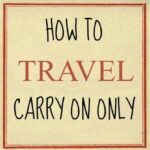 Top Tips to Cut Travel Costs. Our guide books contained two separate tours of Prague, unfortunately, due to our late start and tendency to wander, we only had time to complete the first, “Hidden Streets of Prague”. That said, this tour was extremely comprehensive, we saw a lot and didn’t feel we’d missed out by running out of time. Prague View Point. Prague Tour. 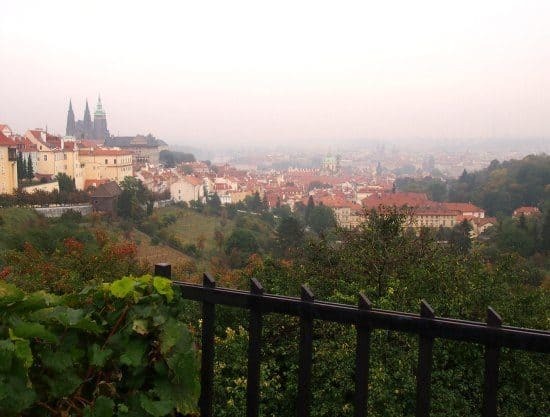 The tour started at the top of the hill, near Strahov Monastery overlooking Prague Old Town. The weather wasn’t perfect, but still, the views were impressive. We reached the top of the hill by tram, we spent the rest of the day slowly walking downhill through fascinating streets, to the main tourist hot-spots near the river. This part of Prague, Hradcany, is significantly older than the Old Town and, were in not for the tour, we would probably never have come this way. That would have been a great shame, it was beautiful. Highlights of Prague Tour. 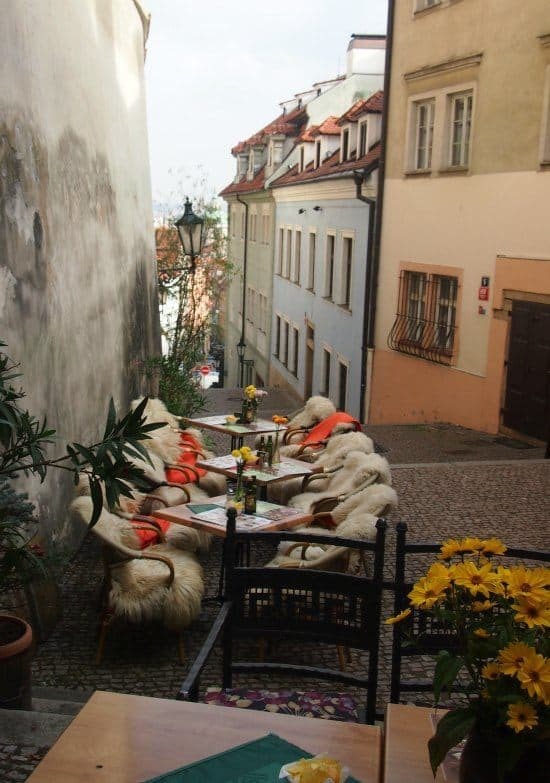 Picturesque cafes and restaurants in the narrow streets of Hradcany. Highlights of Prague Tour, Walking down the hill towards the old town. Highlights of Prague Tour. Prague Presidential Palace. Highlights of Prague Tour. 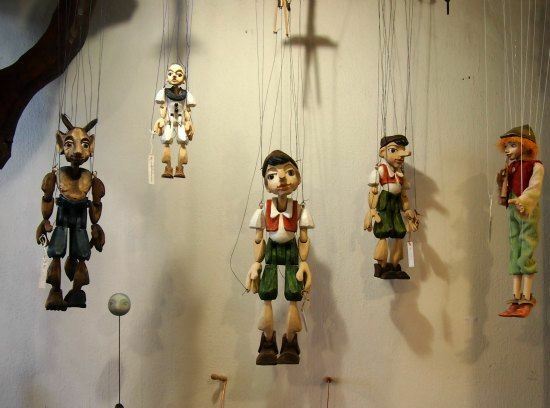 Fascinating shops to browse, like this puppet shop. Perfect for kids! Our tour lead us down to the river and the areas more frequented by tourists. 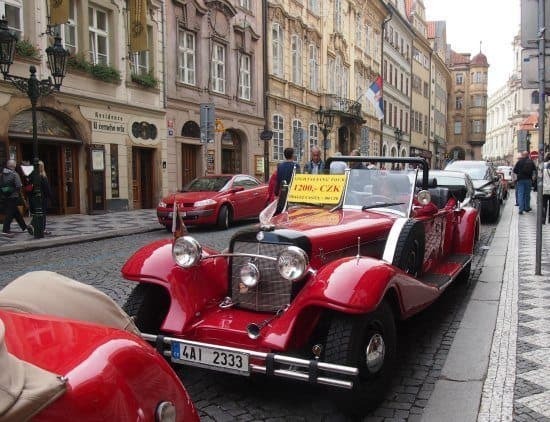 Vintage cars for hire for a tour of Prague. The crowds increase, the closer to the river you get, understandably so, Prague is stunning. We finished our tour at the bottom of the hill, on the opposite side of the river. From here it was easy to retrace our steps back to the tram and to our hotel. Had time allowed, we would have continued with the second part of the tour from here, precise instructions telling us exactly where to go. Our guide books went as far as to recommend particular cafés that we passed, with an emphasis on their child friendliness. We tried one and enjoyed a game of dominoes over coffee and cakes, a lovely little place, again, we would have missed it without the tour. We passed dozens of restaurants, cafés and food stalls. We had to try Prague’s signature ginger bread filled with cream and coated in chocolate at the gingerbread museum. 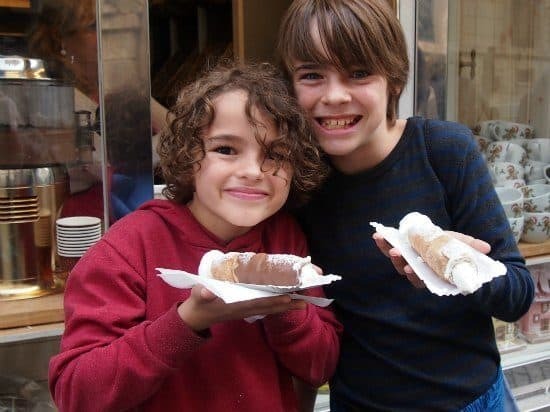 We gave up on real food that day and just went with cake, happy boys! Prague’s Lennon Wall was our favourite part of the day. 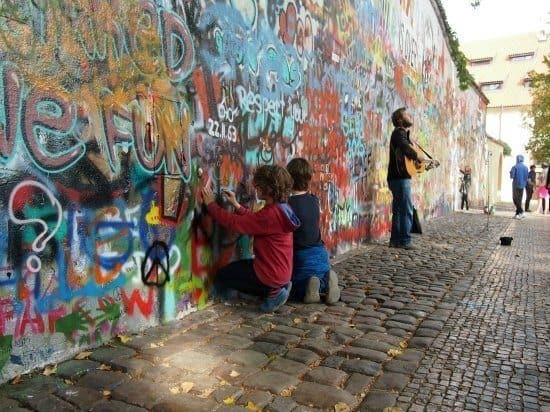 I could say ” Prague’s Famous Lennon Wall’, but to be honest, I had never heard of it. Without the tour we probably would have missed it completely. It’s tucked away in a small street, I had to ask directions to find it as my map reading ability seemed to temporarily desert me, but find it we did. Tour of Prague with kids. The John Lennon Wall is a must see. Our Travelove pack thoughtfully included a pack of coloured chalks for the boys to add their own art to the peace wall. They enjoyed creating, while I enjoyed listening to John Lennon’s haunting music, recreated by a local busker. The Prague Tour Guide Books Aren’t Just to Use on the Day, They’re a Souvenir to Keep. We didn’t manage to complete all of the activities in the children’s guide books during the tour, we just didn’t have time to sit and draw or write. As these tours are totally self paced and self guided, there is no pressure to do so, which is great. When we got home a few days later, we got the books out, completed what we could and reviewed our time in Prague. The guide books make great little souvenirs and as we’re worldschoolers, we can write them up as “school” should we have to submit a homeschool report for this year. 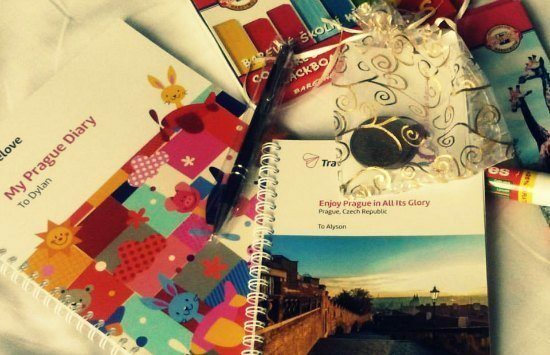 Guide books for the tour of Prague with Travelove, make great souvenirs and are educational fun. What Did The Kids Think of The Tour? We made this pin for you to save to Pinterest, thanks for helping. Prague with kids. 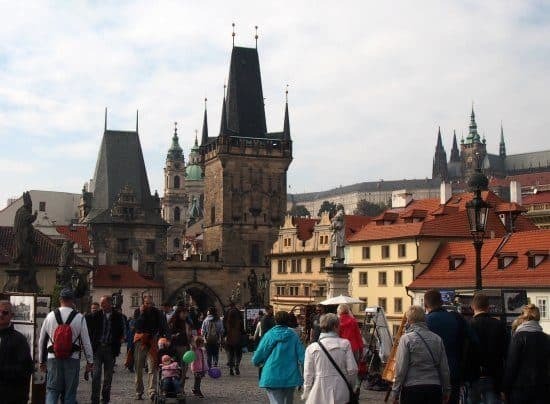 Prague highlights and a child friendly tour. 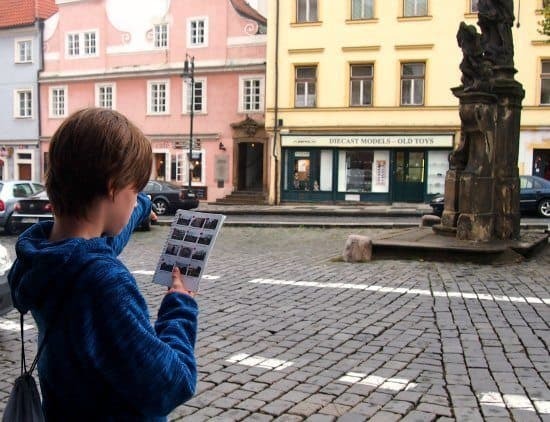 The children liked the Prague for kids tour a lot, they liked that it was a kind of magical mystery tour we had to find our way around using maps and images. It was almost like a treasure hunt. They loved drawing on the Lennon wall and I think their favourite historical attraction was the cannon balls in the church wall. It’s not every day you see that! They also liked that everything was planned, I could tell them exactly how many more tram stops or how much further. Some of the suggested activities in their books didn’t interest them, but that’s OK.
Boo enjoyed the glue-stick jigsaw puzzle above, but we would not have had time to sit and do that on the tour. 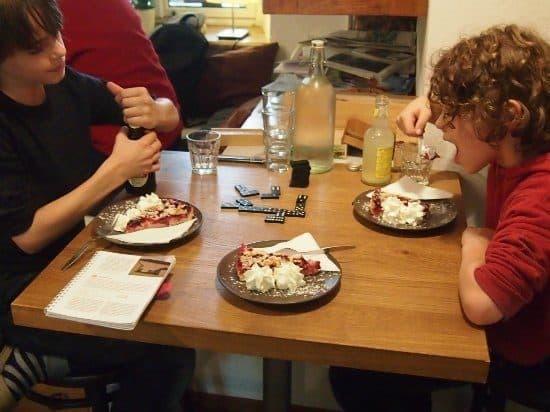 They did enjoy hiding the treasure for the next young explorers to find and overall, enjoyed Prague very much, particularly the cake! Don’t be like me! Buy your tickets easily and don’t waste 1.5 hours of your Prague time by reading these tips before you head out on your adventure. You can buy Prague tram tickets, either at tobacconist shops or kiosks, or from yellow ticket machines. The ticket machines can be found at most tram stops, but not all. We tried 3 tobacconists, none had child tickets, only adult, none could help me with my mission to find one. All I got was a disinterested shoulder shrug. I ended up walking back to my hotel and Googling ” how to buy a child tram ticket in Prague”. You’ll need to use the machines. You will see a window on the left of the ticket machine displaying adult and child prices for a number of different tickets, next to this window is a button for each fare. To access the discounted ( child) price you need to press the discount button FIRST. It’s one of the two buttons on the right of the machine, the one nearest the first window. This is not explained in English on the machine. We needed to buy 24hour tram passes, for aduts, 110 KC, for children 55 KC. If you are only taking 2 trams in any one day, you’re better off buying single journey tickets. Read more about using public transport in Prague here. 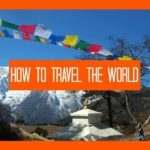 Would We Recommend Travelove Tours? We had done no research on Prague as we were driving across Europe, covering a lot of ground quickly. I honestly had no idea where to go or what to see in Prague and the tour took us to a lot of interesting places. The only thing I knew about Prague was that it has the “Bone Church”, turns out I was wrong, the Ossuary is an hour outside Prague, we went the next day and that post will follow. It was a joy to be told exactly which tram to catch and how many stops to go, even if I did get off to a bad start. Overall, our magical mystery tour was a lot of fun. So yes, we think Travelove Tours are a great idea! 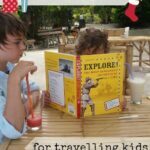 Travelove guide books also make excellent Christmas gifts! 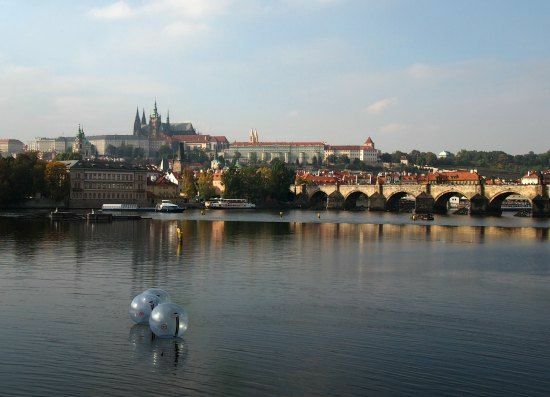 For more things to do in Prague, ( without kids) check out Katie’s blog Wander Tooth. 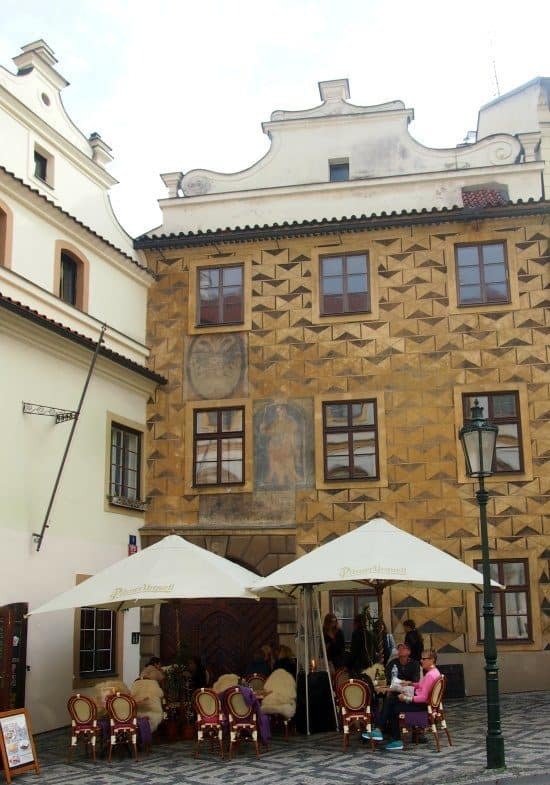 Spent 2 weeks in Prague with a girlfriend who was living there at the time, many years ago & would love to take the kids here – AND Loving the Travel guide books for the kids – could definitely be part of their ‘education’ as you travel….& nice to leave the planning in someone else’s hands…. What a wonderful post! So fantastic! Thanks for your writings – they make adventures like these possible! Wow, talk about spontaneous Sarah! Congratulations and good luck, thanks for letting me know, it means a lot.